Time for another bed bug post..this time about identifying bed bug bites. More often than not people are unaware they have bed bugs until they start noticing the bites so this is quick post about identifying them. Bed bug bites are generic looking and they can look very similar to mosquito bites because they are often no more than small red bumps that itch. An easy way to try and identify whether the bites are indeed from bed bugs is to look for a bite pattern. By this I mean are there 3 or 4 bites in a row. 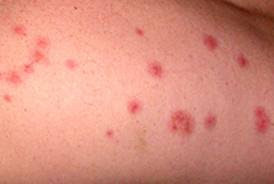 Bed bug bites often occur in a unique pattern of 3-4 bites in a line and this is sometimes referred to as a “breakfast, lunch, dinner” pattern. It is sometimes possible for their bites to be individual and not in the linear group but it is rare. Symptoms of bed bug bites can effect people differently. 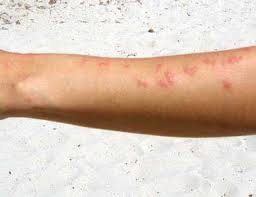 Some people have little to no reaction while some people have the more typical reaction of welts and swelling with the welts being more itchy and long-lasting than mosquito bites. It is important to know that there can sometimes being a lag between the bite and when the welt and swelling appears. This lag can take up to 9 days, but the more often a person is bitten the less of a lag there is will be. If you find you have bites that match mosquito bites and linear pattern then you really should check your home for bed bugs. You can read more about bed bugs which here or our post about bed bugs and travel here. If you discover that you do in fact have bed bugs, give Cottage Country Pest Control a call at 705-534-7863 or email us to book an appointment. This entry was posted in Bed Bugs, Pests, Uncategorized and tagged barrie, bed bugs, bedbugs, business, honey harbour, huronia, integrated pest management, IPM, midland, muskoka, orillia, penetang, pest, pest control, pests, port mcnicholl, port severn, simcoe, tay, tiny, victoria harbour by Tamara Batryn. Bookmark the permalink.